We offer our clients with quality Air Oil Separators that are mainly used in vane and rotary type air compressors for separating oil and compressed air. These separators are designed with a depth loading media and possess excellent oil removing capability that assists effective air/oil separation in various high-end compressor systems. Our assortment of Air / Oil Separators traps oil by allowing it to blend and drain down to a sump while passing compressed air through it. Scavenge line of some type is used to remove oil from the slump. Once the oil is removed, it is again sent to the reservoir for re-compression in a continuous cycle. Further, our range of Air / Oil Separators is available in over 125 designs in order to cater to the different requirements of our clients. These filters have a unique 14 gauge Tube Construction that provides added strength & collapse resistance. 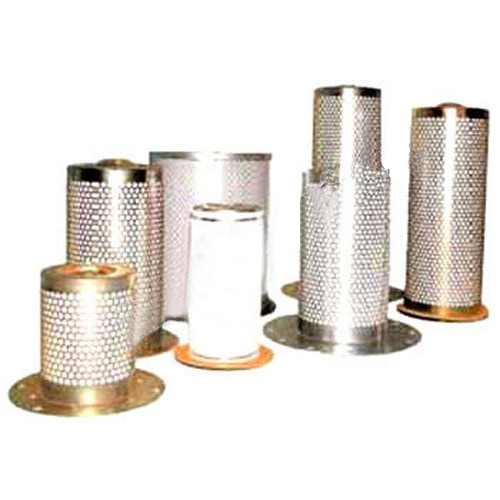 We are manufacturer, supplier, importer & exporter of Industrial Filters, Separators, & Strainers. We offer our clients with a wide assortment of Air Filters, Hydraulic Filters, Oil Filters, Bag Filters, AHU Filters, HEPA Filters, Liquid Filters, Generator Filters, Compressor Filters, Industrial Filters, Hydraulic Line Filters and Return Line Filters, Strainers, Suction Strainer, Air and Oil Separators, ELGI Filters, Atlas Copco Filters, Imported Filters, OEM Filters, DG Set Filters, Ingersoll Rand Filters, Lube Oil Filters, Cummins Filters, Fine Filters, Diesel Filters, Pre Filters. These products are manufactured using high grade sheet metals, filter papers, and adhesives procured from authentic vendors to make sure optimum quality. We have modern manufacturing unit equipped with sophisticated machines that assist us in effective production of Industrial Filters, Separators and Strainers. Our company employs a team of diligent professionals, which has the requisite skills and knowledge to ensure the accomplishment of the set goals. Further, our emphasis to quality has helped us in gaining the valuable trust & confidence of our clients. This is the sole reason of our huge clientele across India, South East Asia, South Africa and Gulf countries.